The Dragons known throughout the multiverse as the Nel’dratha Dragons all have one origin, the one Nel’dratha Dragon known as the Queen or Mother of the Nel’dratha. She was the Mount and familiar of a powerful wizard, he helped her chase a dream. She dreamed of improving upon the immortality of dragons, she wanted more. Together they found a way to bind the power of dragons, undeath and shadow together into one. The Ritual was done at a secret place of power, part of the ritual required the wizard to bind himself to the node. Which later became a source of power for him as he ascended to demigod and later a major god. He became one of the founders of the Shadow Council only to be cast out and banished many years later. It turned out that other dragons had the same dream, but their dream took them to the Queen. The Nel’dratha Queen judged each petitioning dragon and not everyone of them recieved her gift of Nel’dratha. But those who did was infused with a small amount of her essence, resulting in what is now known as the Nel’dratha Dragons. Over time, she created enough offspring to transcend and become something more. Legend says she is now her own plane of existance, a huge necropolis filled with shadowy skeletal undeads. She might appear as the remains of a dead god, but she is still one of the living undead! Exactly where the name Nel’dratha comes from is still to this day shrouded in mystery, but it is believed that it has something to do with the shared dragon dream that lures them on their quest for immortality. Other scholars claim it must have its roots in the ritual performed to create the Queen. Whatever the roots, the Nel’dratha Dragons are feared throughout the multiverse. It is said that even demons and devils are fearful of approaching these dragons, as if their very essence would be in danger. While it is tempting to put them in the same category as zombie dragons, undead dragons and such things, their link to the shadow plane makes them even more Unique than the rest. Nel’dratha Dragons appear as huge skeletal dragons with a baleful purple fire at their center and a shroud of living shadow framing them. Unlike most dragons, they have six limbs each ending in razor Sharp bony claws and a horn on their nose ridge that can grow up to 5′ or more. Their fleshy membrance in the wings have been replaced with what looks like huge blankets of bubbling tar, now and then it even appears as if faces try to push through the surface of the tar. However it is their eyes that has become most coveted, their eyes change upon their transformation. Their eyes turn to huge rough amethyst stones that glow with a harsh light. Several years ago a creature, half man and half lion, boasted that he had slain a Nel’dratha Dragon. His name was Rua’thor the strong and he had fashioned the two amethyst eyes into a necklace he wore proudly. Nobody has dared question his boast yet, for fear of what he might be capable of doing to them if it was true. 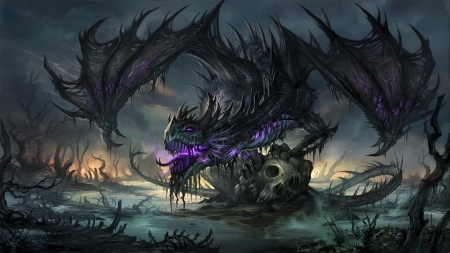 Ordinary weapons are rumoured to wilt away in Black ash when hitting on a Nel’dratha Dragon, even their slain remains is said to retain this effect on ordinary metal. This has led to metallic magical items containing Nel’dratha remains either to be forged of rare precious or enchanted metal.